Known to many as the “White Burgundy of cigars,” the best-selling Ashton Cabinet exudes class and complexity like none other. A 4-5 year aged blend of Dominican long-fillers rest beneath a top-grade Connecticut shade wrapper to create a smooth and refined profile conveying layered tasting notes of oak, cedar, pepper, coffee, and cream. Handcrafted to the highest standards in the Dominican Republic, Ashton Cabinet is the definition of a luxury cigar. Reach for the Cabinet Selection when nothing but the best will suffice. 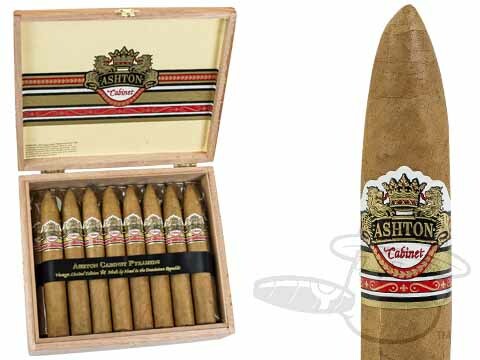 Ashton Cabinet Pyramid delivers creamy top-shelf taste in a carefully crafted 6 x 52 Pyramid vitola. Medium bodied with great flavor. Always has a good draw. Smooth, flavorful notes , nice even burn, aftertaste pleasant to the palate. Ashton Cabinet Pyramid is rated 4.9 out of 5 based on 3 customer ratings.